Find Your Passion With #MountainArtwear T-Shirts! Win 12 months of gorgeous Mountain Artwear T-shirts for up to five members of the winner's household! See the easy way to enter to win at the end of this post! 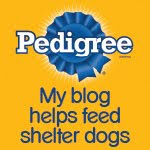 This post is sponsored by The Mountain and the BlogPaws Professional Pet Blogger Network. I am being compensated for helping promote the Russo Rescue Collection, but Bocci's Beef only shares information we feel is relevant to our readers. The Mountain is not responsible for the content of this article. We're thrilled to tell you about a really cool company, The Mountain®, that's been designing and making exceptional T-shirts right here in the USA for over 20 years. 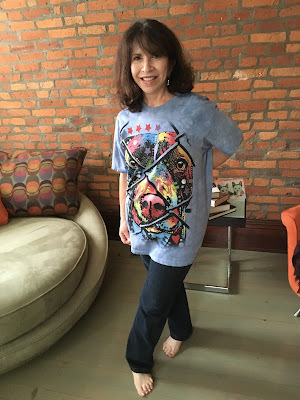 This isn't just any T-shirt company: Their commitment to quality combined with their sound environmental policies have rightfully earned them a huge "cult following"...and Parental Unit and I are their latest converts! It's not every T-Shirt company that uses environmentally friendly, water-based inks and dyes, and purifies its manufacturing waste water without the use of chemicals—these are huge efforts to help protect our water supply and habitat for local wildlife. Kudos to The Mountain company for always taking protection of our planet seriously! 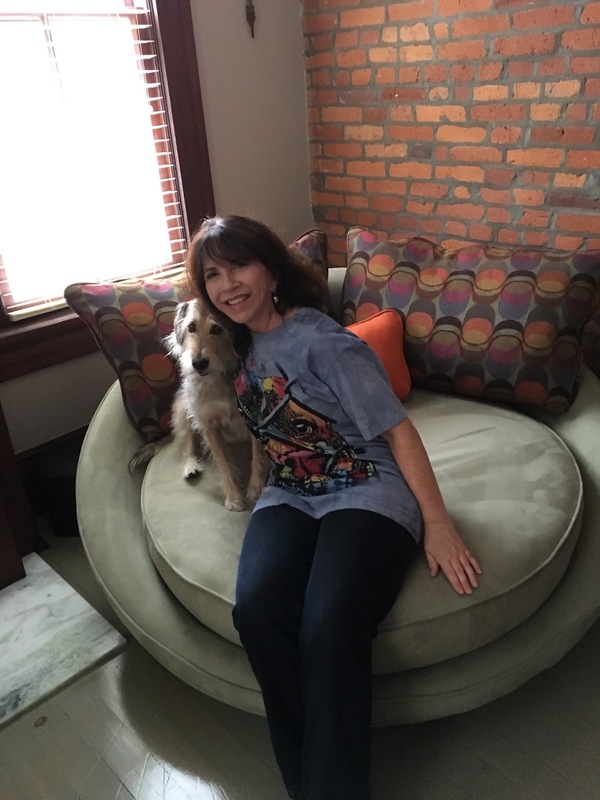 And that's not the only good things the company is doing...The Mountain has launched a new line of T-shirts by artist Dean Russo, featuring dogs, cats and horses in vibrant colors and abstract designs. 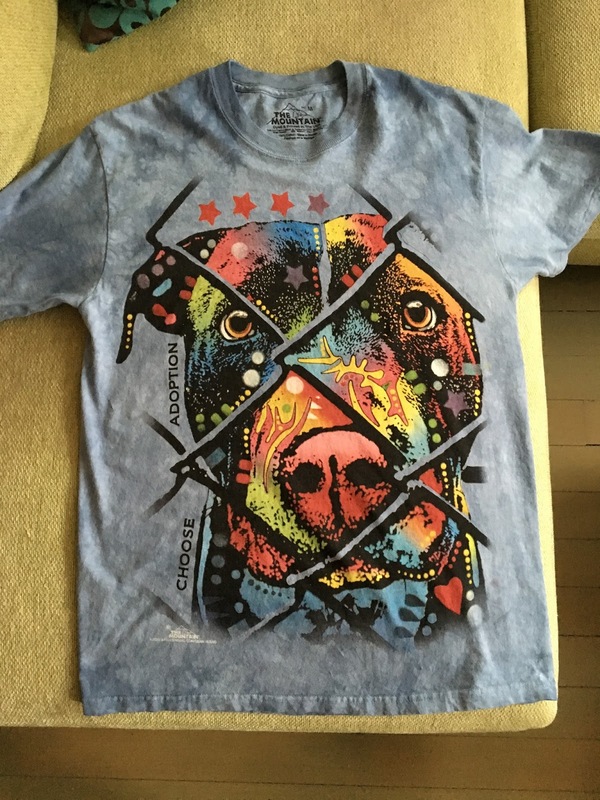 Aptly titled, the Russo Rescue Collection, a portion of all proceeds from the collection sold during this campaign will go to Best Friends Animal Society, the largest no-kill animal sanctuary in the country. 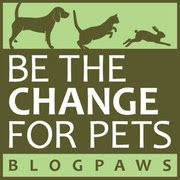 As many of you know, Best Friends' mission is to "Save Them All" by eventually taking the "kill rates" in our nation's shelters to zero. Russo's T-shirt collection beautifully captures the passion of the Best Friends Animal Society movement, and the spirit of the animals he depicts on his shirts. Here's a photo of Parental Unit's new T-shirt, sans Parental Unit. Isn't it gorgeous? Parental Unit proudly showing off her new Dean Russo T-Shirt. In addition to Russo's T-Shirts, The Mountain has an incredible variety of pet-related apparel, perfect for holiday gift-giving...and treating yourself, too! All T-Shirts and other garments are made with 100% pre-shrunk cotton, so they're super soft and super comfortable. And get this: All Bocci's Beefs readers get 25% off site wide! Just use the code MTNPETS. But hurry! This coupon is only good through September 30th! 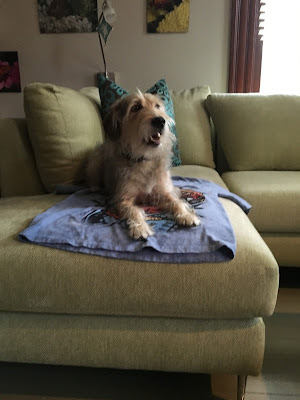 Whadayamean I'm not supposed to sit on your new Dean Russo T-Shirt? Now on to the gigantic T-Shirt Giveaway courtesy of The Mountain! One lucky (group) winner will be able to choose 12 months of gorgeous t-shirts for up to five members of their family. Giveaway open to U.S. residents only. Just follow the Rafflecopter directions below. Good Luck! What a cool t-shirt. It's just beautiful! Wow, I had no idea about the environmental cred of this company. I just know they make awesome shirts. I wear my Blog Paws shirt all the time! Yes, we're very impressed with the company's "green" efforts! Parental Unit is a recovering attorney and practiced environmental law for many years—their efforts are impressive indeed! I think Bocci is trying to suggest that they make these cool shirts in dog sizes! This shirt has such a great message when you look closely. Beautiful!